Earlier today I posted an article dealing with one of the popular misconceptions people have with knowing the will of God or hearing the voice of God as it pertains to guidance. This is an area in which there is a lot of misunderstanding among Christians. Thankfully there are all kinds of great books written on the subject. I highly recommend that every Christian try at least one of them (and particularly so if your understanding in this area has been largely influnced by men like Richard Blackaby or John Eldredge). So allow me to make a few suggestions. Each of these books shares a similar understanding of how we can know God’s will. The differences between them are more size, style and audience than theology. 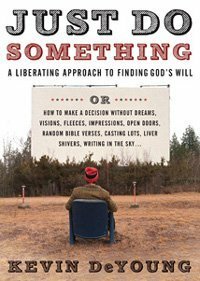 Decision Making and the Will of God by Garry Friesen. This is the classic and the granddaddy of all the books on both decision making and understanding God’s will. The book is very thorough which is both a strength and a weakness. It’s one you can use for reference, turning to just the parts you want to read, or you can read it straight through. In either case you’ll benefit. My favorite bit is where he discusses “the case of the missing dot” and deals with the idea that we can somehow be outside the center of God’s will.